Gurumin 3D: A Monstrous Adventure feels old. Well, it is old – this is a 3DS port of a game that first came out in 2004 – but it feels even older. I don’t mean it feels dated, because it certainly doesn’t, but that it has the look, feel, and charm of a PlayStation-era game. That’s a lovely thing. The ‘90s (and to a lesser extent, the early 2000s) were rife with relatively low-budget games of all sorts. This was long before the game industry had discovered photorealism and started trying to be Very Very Serious and Mature, when publishers were willing to take a risk on localising niche Japanese games. They weren’t all great, but this willingness to take risks brought us wacky, wonderful gems like Tomba!, The Misadventures of Tronne Bone, and Grandia. It’s that spirit that shines through in Gurumin 3D. It’s not a particularly innovative game, it’s far from a technical masterpiece, but its quirky sense of fun and adventure is enough to carry it through. 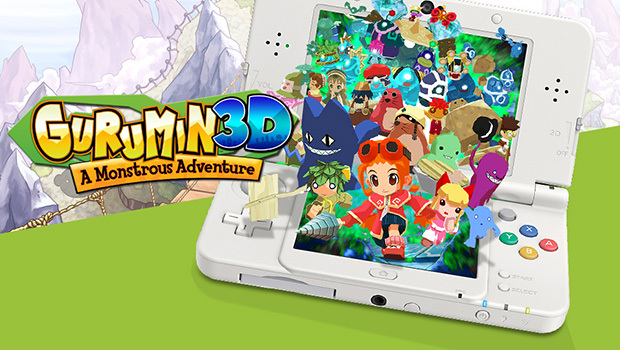 Gurumin 3D follows Parin, a young girl who moves to a small mining town to live with her grandfather. Being the only kid in the town makes life boring, at least until she finds a strange portal and befriends the monstrous residents of Monster Village on the other side. Then everything goes wrong: Monster Village is attacked, Parin’s friends kidnapped, and the monsters’ world is shrouded in mist. Armed with a weaponised drill, she sets out to save the day. What follows is a fairly typical action-adventure game: as Parin, you explore dungeons, solve puzzles, fight monsters, and collect treasure that can be used to buy and upgrade equipment. Combat is a straightforward hack-and-slash affair, with enough variety in enemies to keep from ever getting too stale. Level design is interesting enough, and there are plenty of secrets to be found within each. Light RPG elements add a sense of character progression, and open the door to grinding of you’re that way inclined. Taken purely on a mechanical level, Gurumin 3D is a serviceable but unremarkable action-adventure game. What sets it apart, though, is its adorable aesthetic. A cutesy anime art style is nothing unusual, especially in 3DS, but Gurumin manages to find its own identity. Monsters are simple – barely more than blobs, a lot of the time – but their expressive animations give them life. They’re cute, weird, charmingly annoying little critters, and that goes for the enemies (“Phantoms”) as well as friendly monsters. Of course, Parin is the star. She’s full of sass and gives one hell of a side-eye, but she’s adorable, brave, smart, and caring. The lengths she goes to for her newfound friends, and the compassion she has even for her enemies are inspiring. She also drops one-liners and throws shade like no one’s business, both of which are highly undervalued skills. She’s not a deep character per se. Nor are any of the others, and the plot itself is very familiar save the world business with few surprises. But it has heart, and sometimes that’s more important. It takes what could have been a very pedestrian game and turns into an adventure full of joy and fun, from start to finish. Gurumin 3D: A Monstrous Adventure is developed by Nihon Falcom and published by Mastiff. It’s available now for 3DS. A press copy was supplied by Mastiff for this review.